App News : TeachMe Apps Discounted for Mother's Day! App News : TeachMe Apps Discounted for Mother’s Day! To celebrate mothers everywhere, 24x7digital is putting the entire line of TeachMe educational apps on SALE for just 99 cents each from Thursday May 9 to Sunday May 12! 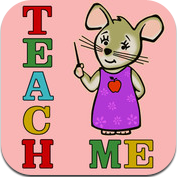 TeachMe: Toddler, TeachMe: Kindergarten, TeachMe: 1st Grade, TeachMe: 2nd Grade, and TeachMe: 3rd Grade — all just US$0.99! Thank you I lovvvvvvvvve these apps! they did a good job in designing the apps!